It’s the annual Nightmare Night celebration, and Ponyville is decked out in their spookiest fashion. 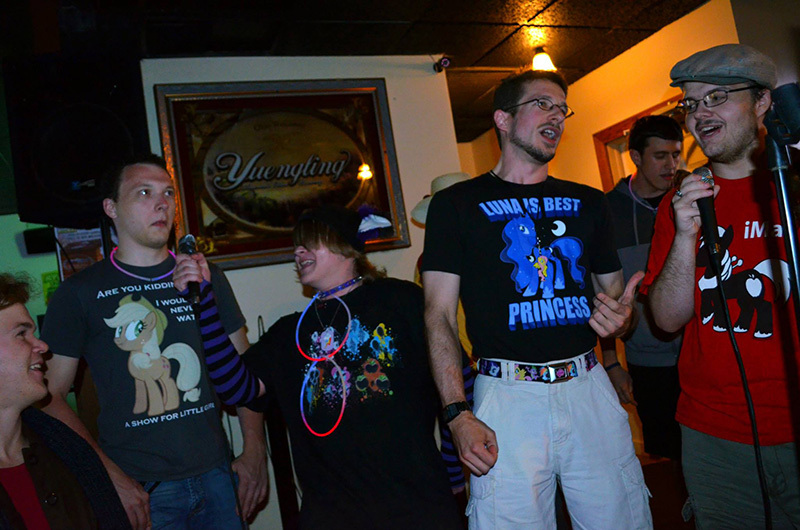 But when Princess Luna picks tonight to make an appearance to reacquaint herself with her subjects, everypony reacts in terror. Can Twilight help the princess of the night convince the town that she’s no longer someone to be feared? I both really like and am endlessly frustrated by this episode. There’s a ton about the episode to love. We get the long awaited return of Luna (since her first appearance at the beginning of last season! ), it’s the first real “holiday” episode of the series, and in general the episode is fun to watch, with a bunch of great gags, character moments, and background details. The problem with it is from the continuity end. This is an episode that relies pretty heavily on the callback to the series opener, and so it’s a little bit frustrating that there’s not much in the episode that makes sense within that context. The least egregious (in my opinion, at least) but probably most obvious is Luna herself, who has undergone a bit of a redesign since her first appearance. She looks much more similar to Celestia now, albeit a “night-themed” one with a flowing starry mane as opposed to Celestia’s bright multi-colored pastel one. The actual reason for the redesign is a little bit fuzzy, as from what I can tell based on comments from Lauren Faust about it, it seems to have been a late decision and one that she didn’t have much input on, meaning it probably happened after her leaving of the show. 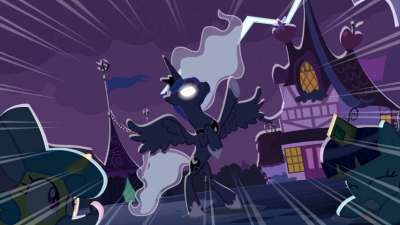 Her after-the-fact explanation to confused fans was that the Luna we saw in the first season was a heavily de-powered one, and that over the course of that appearance and this one, she’s slowly been regaining her strength and magic, leading up to this version of her in which her magic is back to full strength. For what it’s worth, I like her new design well enough, and the fandom by and large just shrugged and embraced it relatively easily (although the “Woona” design from S1 as it’s come to be called still has a rather loyal fanbase). It should be mentioned that an entire arc of the comics was dedicated to trying to bridge the gap between Luna’s first appearance and this one, giving us a bit more of her character and actually showing the transition between the two designs. It’s actually a very good run of the comics, but it winds up making the other continuity problems of this episode even worse. The real issues with this episode aren’t really with Luna, but rather with the rest of Ponyville, as their general reactions to Luna and the concept of Nightmare Night in general don’t really mesh with what we were shown in the first episode of the show. There, Nightmare Moon was a vague mythic fairy tale, one that most of ponydom had either stopped taking remotely seriously or simply outright forgotten over time, to the point that Nightmare Moon herself appearing before the entire town’s population elicited a response of confusion more than it did fear, as it appeared that they didn’t even recognize who it was crashing the celebration. But in this episode, we’re basically presented with a Halloween analogue with Nightmare Moon as the central figure, with her imagery plastered everywhere around the town. Heck, there’s even a straight-up statue of her outside of the Everfree Forest that ponies traditionally are supposed to give offerings to on that night and tales of her gobbling up little ponies who don’t satisfy her hunger. With this episode existing in a vacuum in which the first two episodes of the series didn’t happen, it’s actually laid out fairly well and makes for some interesting world building and mythology, but it clashes headfirst with what we’ve seen prior to it, and just raises all kinds of confusing questions. 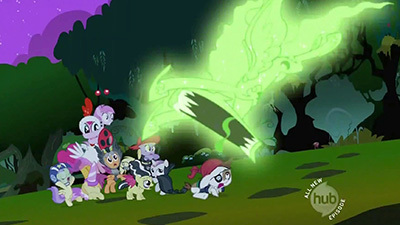 Did Nightmare Night exist prior to Ponyville discovering that Nightmare Moon was an actual for-realsies thing? The implication is yes, as it’s certainly not treated like a new idea, and certain bits of dialogue hint strongly that it’s a thing that’s happened for a long time and probably all over Equestria. But in that case, why doesn’t anypony other than Twilight recognize Nightmare Moon in the opening episode? The only potential explanation I can think of is that Nightmare Moon prior to the year before was a vague, shapeless concept to them, and that it’s only after her showing up in the flesh that the town covers the whole holiday in much more specific imagery and that the statue is a very new addition, but then that comes off as very mean spirited towards Luna (unless, of course, it isn’t particularly known that Luna and Nightmare Moon were the same pony, as really the only ones around to see her de-transformation were Twilight and the others, but that kind of leads in to a question the show isn’t ever particularly good and pinning down and holding to consistently, namely just how well known the Mane 6 and their exploits are actually supposed to be). Poor Luna’s treatment is also a little confusing, as Ponyville kind of specifically threw a party celebrating her return in which she seemed to be generally well-liked, but this at least can kind of be hand-waved by the fact that she looks a bit different (and slightly more evocative of Nightmare Moon) now. Okay, rant over. I hope that I haven’t already put people off by leading with the ranty bit, because I do genuinely love this episode despite the fact that the basis for it makes exceedingly little sense. Specifically, I love Luna and her long-overdue fleshing out as a character. She’s reintroduced as an anachronistic awkward dork, having a difficult time adjusting following her thousand-year banishment as some of the things that held true prior to her return aren’t taken quite so well. The ROYAL CANTERLOT VOICE is hilarious, and I love her having to learn to drop it (getting lessons more from Twilight than from poor Fluttershy, who appears to handle Nightmare Night by locking herself in her house and refusing to take visitors and quickly goes somewhat catatonic once Luna gets her hooves on her). But in her awkwardness, we also get some of the sadder side of Luna, convinced that her subjects will never like her, since, after all in her mind, they never did in the first place (which was part of what led her to becoming Nightmare Moon in the first place). Twilight and her friends Applejack try to offer advice as to how she can change her approach to come off as less intimidating, but every attempt is thwarted by Pinkie’s terrified overreaction (and Rainbow Dash’s incredibly poor-timed pranks). At some point, Luna kind of just breaks, leading to a rather frantic final attempt to gain her subject’s favor before her frustration boils over and she outright decrees that the holiday never be celebrated again. So Pinkie’s kind of a thing in this episode. More specifically, the implication appears to be that she’s purposely kind of trolling the crap out of Luna from the start. To be fair to her, her reasoning for doing it seems to be in the spirit of the holiday, that the point of it is to emulate fear for the fun of it (and the candy!). From there, the ending of the episode kind of leaves me scratching my head a bit, since it sort of wraps up a bit too quickly and things just suddenly work once Luna plays along, which I’m not terribly sold on working quite as well or as fast as it seems to. Also, this is the first time (but far from the last) that we hear the name Star Swirled The Bearded. Er, ahem, sorry, just a bit of a Luna fan here. I kind of have to laugh that Tessa described the fandom’s acceptance of Luna with the words “shrugged” and “relatively easily,” as those wouldn’t be my first words used to describe it; instead, they would be along the lines of “explosively fanboyed/fangirled” and “rabidly.” Luna consistently dominates the polls over at brony hubs like EqD, and for the past two years she’s pushed Applejack out of the Mane Six for favorite pony in the State of the Herd Report (see page 80 of the 2014 report). Her popularity-to-screentime ratio is off the charts, rivaled perhaps only by Trixie and Derpy (I haven’t done the math, but I’m sure somepony out there has). Why so much love? Psh, who knows… even I don’t know, and I wear her on my shirt! But enough chit-chat. Time is candy! I think M.A. Larson absolutely nailed Twilight’s personality in this episode. Right out of the gate, we see that she doesn’t mess around when it comes to making the perfect costume, regardless of how obscure it is. 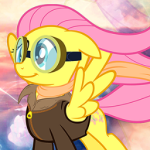 What’s even better, she’s sure others will recognize the costume and is shocked when no mortal pony does; that’s pure adorkability right there. Perhaps the reason this resonates with me so much is because many years ago I made a Halloween costume of Pharoah Man. You know, that robot master from Mega Man IV? Yeah, none of the other folks knew either, and it didn’t help that the costume was awful, too. In an amusing tangent, I suspect were I to try wearing that costume again these days I’d actually run a better chance of someone recognizing it since the adults would be my age and thus may have grown up playing Mega Man on the NES as well. Too old for free candy? Never. Speaking of non-Luna characters, Zecora seems to have been finally accepted by the Ponyville residents as a respected member of the community. I mean, no good mayor would let an outsider feared by many throw vicious-looking green powder at the village foals, now would she? While a whole “Welcome to Ponyville, Zecora!” story would have been a shoe-in for an episode plot in Season 1, it’s kind of nice that we didn’t get one and instead can infer it for ourselves (either that, or leave it as episode fodder in later seasons should the need arise; backstories can be fun too!). It’s a subtle bit of progression that I appreciate: the sentiment of Ponyvillians can and does evolve, if at times in fits and starts and not always consistently. Which brings me to the odd inconsistencies that Tessa had addressed. I for one subscribe to the “regained power” explanation of her physical changes and don’t think much of that (other than her full-power form kicks flank), but the strange clash of everypony knowing about Nightmare Night yet having such limited knowledge of the actual foretold return of Nightmare Moon herself is indeed bizarre. My take on it is that it was just a holiday in which everypony participated, and that over the years the meaning behind it had blurred and became less relevant (much like Halloween for most Americans; I couldn’t tell you a thing about its history beyond what I could look up on Wikipedia while stalling for time). Luna had returned and Nightmare Moon was vanquished, true, but why would that stop anypony from continuing the tradition? Reactions to the Princess of the Night’s unexpected attendance seemed mostly appropriate, though, perhaps similar to a convicted felon being released from imprisonment and coming back into society: said felon might be completely reformed and have all the best intentions of doing good by all from now on, but the stigma is still there (not to mention society has progressed some number of years… 1000 in poor Luna’s case). Heck, even Zecora hoofed it out of there when Luna showed up at first! So clearly there’s still a good deal of past baggage to deal with, but Luna tries her best to deal with it… in the most wonderfully awkward ways possible. Where this episode falters in continuity it more than makes up with absolute fun. Trying to get somepony who has been locked away for a thousand years to adjust to modern life, modern speaking volume, modern economics, and modern fun is certainly no easy task, but Twilight’s not about to let that stop her. Of course, every time Luna gets a handle on a new skill, Pinkie shows up and immediately misconstrues it as something sinister. The first time I watched this episode all those years ago I still hadn’t quite “gotten” Pinkie, so I too felt some of the anger and frustration assaulting poor Luna. 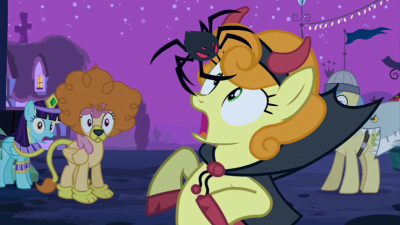 I also probably would have gotten nightmares had plush spiders suddenly come alive an crawled over my face, so at the end of the night I think everypony had some egg (or spider) on her face. Arriving at the final resolution to the episode did kind of feel like quickly hopping along stones to cross a river, but in the end I think it worked out well nonetheless. Luna has gone from “I’m sad I’m on the moon” to a character with some very serious flaws but very serious desire to improve, and it’s a very welcome change. I can’t quite remember if I had previously rated this as my favorite episode of Season 2, but since it’s been a while I’m going to hold off on making that claim until I’ve been able to deconstruct the remaining episodes of this season. Regardless, this one rates pretty high up there! If you need more music even after all those links I peppered throughout the post already, then you absolutely can’t go wrong with Nightmare Night by WoodenToaster and Mic The Microphone. The SFM adaptation of this song is quite possibly one of the best SFMs ever made to date, though if you’re new to the series be warned that it contains what could be considered a major spoiler. BUT IT’S SOOO GOOOD. Unless you want some more dumpstep, in which Tis a lie! by µThunder should be right up your alley. This song is a bit more fitting to Luna’s brony-built gamer personality, and the drop around 2:10 never fails to make me grin so much that the smile breaks through the edges of my cheeks. This will be brief; my son has his last set of molars coming in on top of a head cold and general toddler mayhem. He has elected to never sleep again. Why is teething even a thing. I really like this one. Your standard-issue Halloween themed episode with some Rip Van Winkle and Princess Among Paupers (or God Among Mortals) for funsies. Luna is 100% a fish out of water, and needs significant tutoring in modern social grace. Probably ancient social grace, too, she doesn’t seem to have spent much time in the equivalent of Ponyville back before the whole Nightmare Moon thing. Tessa’s rant strikes a chord that I noticed while watching. Why was Nightmare Moon both a celebrated annual event and a complete unknown? It’s easy to gloss over and handwave in light of the episode quality, but a good candidate for fridge logic. Pinkie Pie reminds me a bit of YouTubers doing Horror Let’s Plays. She enjoys being scared within an appropriate environment. Actual terror is a different thing entirely, but she’s definitely the kind of girl who would visit a haunted house or watch scary movies with the lights off. I could not. My reaction to that kind of thing is harsh deconstruction. 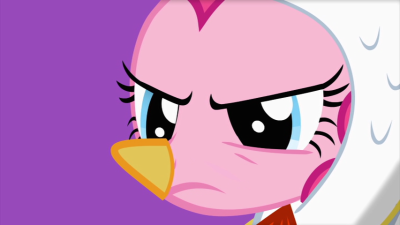 I do, however, enjoy watching other people enjoy it, and in that way Pinkie Pie delights me. She’s a little insensitive towards Luna’s attempt to blend in, but it does drive her towards accepting the role of annual quasi-villain, which could help her fit in a little more the rest of the year. I hope Luna shows up regularly. She could use the friends. I really love that she and Twilight Sparkle get along so well. I suspect that she and Rarity would get along famously. 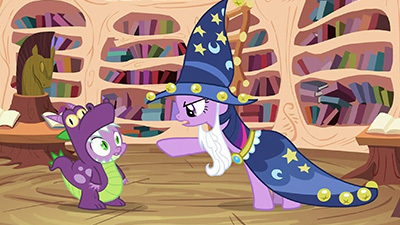 One thing I forgot to mention is that this episode shows how well Luna and Twilight can work together in an episode: not only do they share a strange kind of bond (in that Twilight was the one who took the charge to free Luna from Nightmare Moon), but they’re both very knowledgeable yet awkward in their own ways. Just before this deconstruction went to press I finished listening to the audiobook version of Apotheosis, a fanfic (one of many) about an adventure that Luna and Twilight go on together. While perhaps a bit fragmented at times, the story does show the interesting interplay between the two characters when placed into very distressing situations. Worth the read/listen if you are interested in fanfics (spoiler alert: it gets a bit shippy toward the end). The text version on FimFiction is here, and the audiobook version on YouTube is here. Something I meant to mention and completely forgot about – there was a dropped scene from this episode (presumably cut for time) that didn’t survive the trip from storyboarding to animation (presumably there’s a lot of that kind of thing, but this is one of the few that we’ve heard details about). Originally Twilight was supposed to take Luna to go see Rarity during this episode at some point, in which the fashonista recommends that Luna change her look to help her image with the town, and proceeds to dress her up from head to hoof in pink frilly nonsense. Luna is less than amused, and eventually gets fed up with Rarity overdoing things and tears off the dress, with Pinkie showing up at just the wrong time to see the dress remains in Luna’s mouth. Also, Luna is voiced by Tabitha St. Germain, who also voices Rarity (and Granny Smith, among others). Ah, okay. I also questioned the lack of Rarity, but it sounds like this scene had it covered. I can understand why it didn’t pass the chopping block, as they already had enough story beats of Luna’s actions being misconceived and this was the least necessary one.